Get a Missouri Employers Mutual workers compensation quote. We're a MEM Elite Partner and we help you find lower insurance rates. 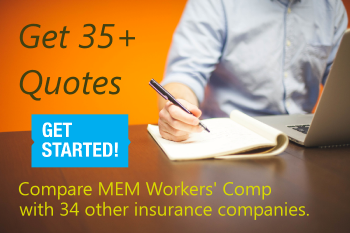 What Makes MEM Workers Compensation Better? Missouri Employers Mutual is currently the largest workers comp insurance company in the state. They wrote their first workers compensation policy in 1995, after getting a $5 million dollar loan from the state. Their purpose was to help foster competition on rates and MEM now offers some of the lowest rates in Missouri for select class codes. They have a strong focus on safety and provide free services to policy holders. MEM Insurance currently has an A- rating from A.M. Best. Missouri Employers Mutual Ins. has a broad appetite for hundreds of business types and industries throughout the MO state. And they offer four rate tiers to provide more competitive quotes to businesses who qualify for premium discounts. Missouri Employers Mutual has a strong reputation for superior safety services, loss prevention services, and claims handling. Their total medical costs per claim are lower than the national and state averages over the past four years. This often reflects in their workers compensation rates. MEM offers valuable safety resources through the WorkSAFE center including sample drug policies, other workplace policies, and customized industry training for employers and employees. Our agency has partnered with MEM to make it easier and more affordable than ever to shop workers compensation insurance with Missouri Employers Mutual. We're a MEM Elite Partner and we know how to help employers get the most out of a Missouri Employers Mutual workers compensation policy. Call us for a free quote today. Effective January 1 2016, MO State law requires owners and officers to use a payroll amount of $39,500 to calculate premium. This applies to sole proprietors, partners, corporate officers, and LLC members. Owners may automatically assign 10% of their payroll to 8810- Clerical Class Code. Get Pay As You Go workers compensation from Missouri Employers Mutual. We offer easy pay solutions designed to improve cash flow and protect your business from large audit balances with our Pay As You Go options. Whether you want us to work with your current payroll provider, or you're looking for a payroll and workers compensation solution in one. Workers Compensation Shop can help purchase Pay As You Go workers' compensation insurance and find a great payroll provider. *Workers Compensation Shop is an approved vendor for MEM's EZ-Pay program. Missouri Employers offer four rate tiers for pricing premium. Rate tier selection is based on factors such as premium size, loss history, occupational exposure, hazard analysis, and class code fit. The industry standard. 15% to 25% down with 3 to 9 installments. Available with some of our carriers to help improve cash flow and reduce upfront premium due. An improved version of 12 equal installments that helps protect against additional audit premium. A proprietary program of generating and paying premium based off of you current payroll system. A proprietary program where we report and collect premium from your current payroll company. Our own solution for integrating payroll and workers' compensation into one service. Missouri Employers Mutual is headquartered in Columbia, MO. They have branch locations in Kansas City, St. Louis, and Springfield. Currently, MEM ins. is only licensed to sell workers compensation in Missouri. Call us today at (888) 611-7467 for a free, no-obligation Missouri Employers Mutual Insurance Quote from a MO based agency specializing in workman's comp coverage. Real Agents. Fast Missouri Quotes. At Workers Compensation Shop.com, we want to help Missouri employers find the most competitive workers compensation coverage available. That's why we shop all of our insurance partners when we quote your business. Missouri rates are expected to increase nearly 15% during 2014. Its more important that ever for business owner to compare multiple carriers to ensure their getting the best deal.